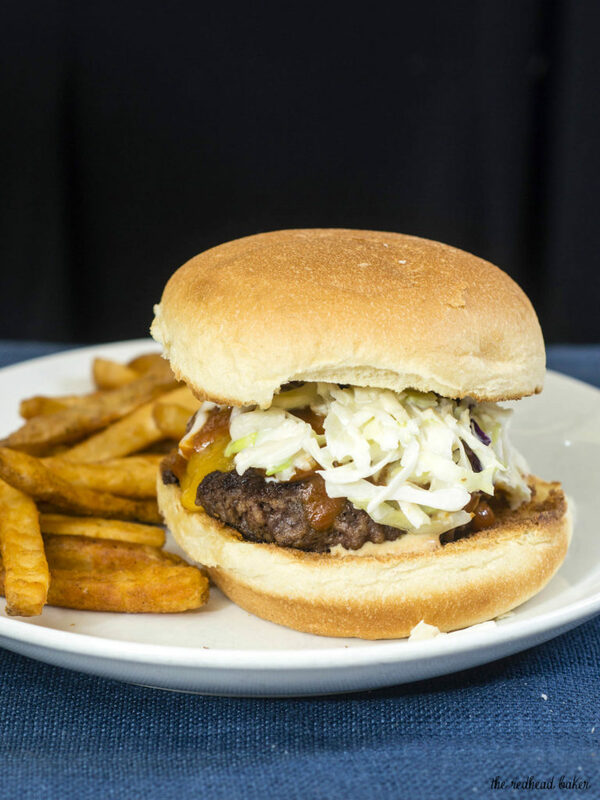 Carolina-style BBQ burgers are juicy beef patties topped with sharp cheddar cheese, tangy mustard- and vinegar-based BBQ sauce and coleslaw. Happy Father’s Day! In honor of our dads, the #SundaySupper bloggers, hosted by Sarah of The Chef Next Door, are posting about dads’ favorite recipes. When I think about the food my dad likes, the first thing that I think of is the grill. It probably sounds stereotypical. But it’s true in this case. My dad loves to grill. I still remember quite a few times growing up when we got significant amounts of snow. One of the first things my dad would shovel out was his grill. Yes, my dad even grilled in the winter. When we go over for a cookout, there’s a huge spread of food, even if there are only 6 or so people for dinner. There’s burgers and chicken and steak. There’s cheese, tomato, lettuce, onion and picked jalapenos for the burgers. And there are at least four different condiments: mayo, ketchup, and two kinds of barbecue sauce. There’s fruit salad, pasta salad, potato salad, and corn on the cob. One recent addition to the condiment lineup is a tangy “Carolina Gold” barbecue sauce that my dad really likes. 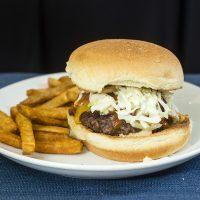 I posted the recipe for the sauce on Wednesday, and I used that sauce and cole slaw on a simple beef patty to make Carolina-style BBQ burgers that I think my dad would love. Divide the ground beef into 4-oz portions and shape into patties. Heat a cast-iron skillet over medium-high heat, and cook the patties for about 8 minutes for medium-rare doneness (or to your desired level of doneness), flipping once halfway through cooking. 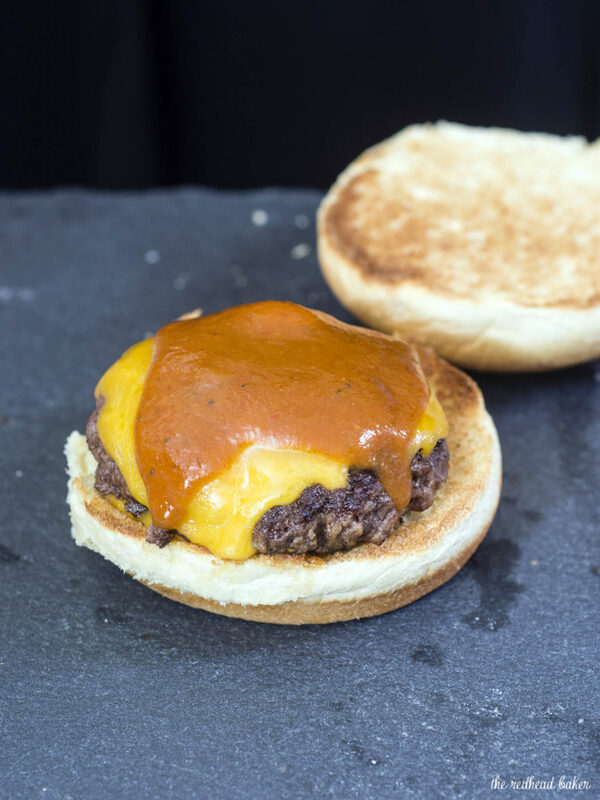 Lay a slice of Cheddar cheese over each burger, and cover the skillet for about a minute to let the cheese melt. While the cheese is melting, turn the broiler to high, split the buns and place cut-side-up on a baking sheet. Toast under the broiler for about 20 seconds, until light golden brown. Place a burger on each bun. Top with about 2 tablespoonfuls of bbq sauce and about 1/4 cup of cole slaw. Enjoy! Beautiful photo of your burger! Delicious looking. My dad was a BBQ fiend too. You remind me, I need to shovel out my grill. Sounds like your dad cooked on wood. So funny ~ your dad shoveling snow to clear the grill for cooking out! The burger looks great! I’ve never heard of a Carolina burger, but now that I’ve seen one, I’ll never forget! It looks scrumptious! Summertime = BBQ time in my house, and I’m totally loving this new addition! Looks amazing! I love burgers with slaw on them! 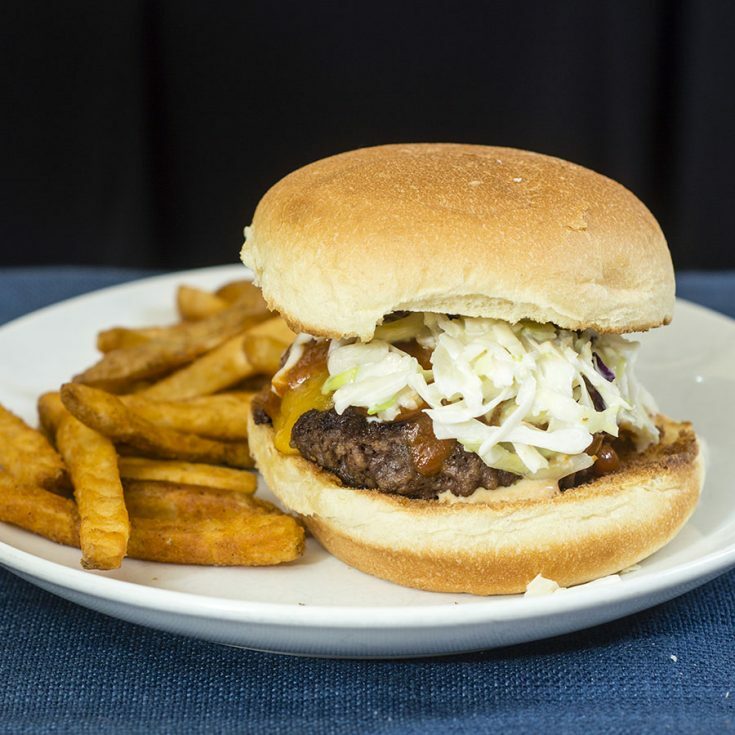 it’s the only way I eat slaw and these burgers look so good! 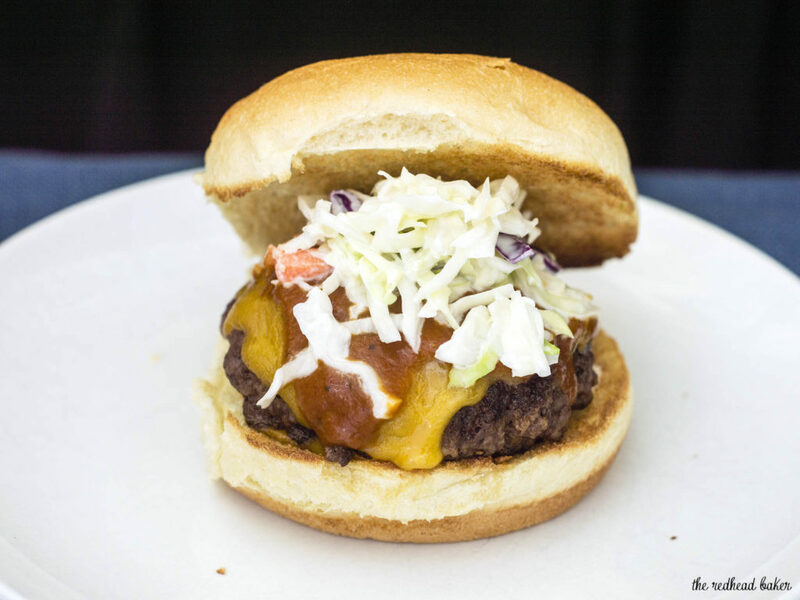 I think burgers are the epitome of Father’s Day fare.